To celebrate Halloween, I'm offering my readers a treat. 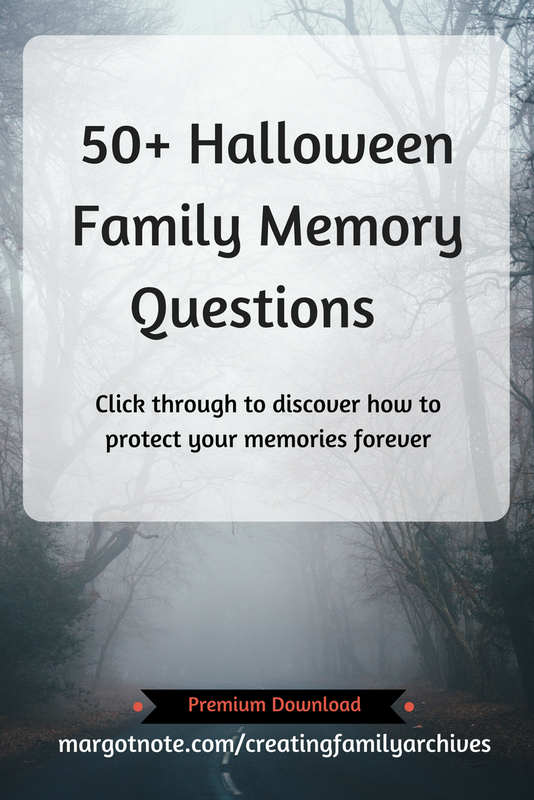 I've created an oral history kit with over 50 questions to capture family memories about All Hallows' Eve. The questions are crafted to give you more than yes or no answers and are tailored to uncover information about your loved ones. I've also made it that anyone--young or old--can be asked these questions. Ask them to the oldest member of your family and the youngest and compare answers. You may discover Grandpa's favorite "tricks" he played on Goosey Night! What was a family member's favorite Halloween costume over the years? Mine have ranged the gamut from the usual (angel, graduate, ladybug) to the strange (Lady Miss Kier of the band Deee-Lite, a Norwegian Black Metal dude in corpse paint, the Zodiac Killer). Me (upper right corner) as a pensive princess in first grade. Find a quiet place to interview your subject, and ask questions one at a time. Be a good listener, and use body language that is encouraging. Nod, smile, and use silence to allow them to talk further. If your interviewee makes a general statement, ask for specific examples. I also encourage people to be flexible when conducting oral history interviews. Pick up on promising stories introduced by the interviewee, even if the topics are not planned. Most importantly, enjoy yourself!